A home equity line of credit (HELOC) is a loan secured by the equity in your house. A HELOC is often presented as a great borrowing tool because unlike with credit cards or unsecured loans, you have access to a large amount of revolving cash at a lower interest rate. But what you probably don’t know is that your bank can change the borrowing terms on your HELOC whenever they want. 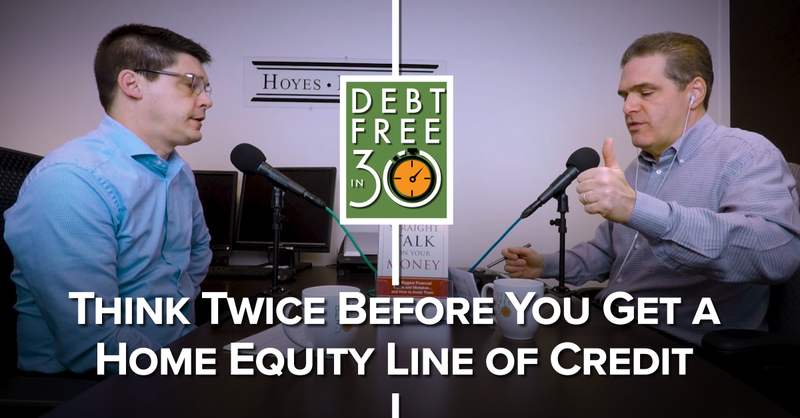 I talk with Scott Terrio and he shares why you need to think twice before signing up for a home equity line of credit. Home equity is the difference between the value of your home and the unpaid balance on your mortgage. Your home equity goes up two ways: by paying down your principal balance; and if the value of your home increases. In Canada, you can access up to 65% of the value of your home through a home equity line of credit. Payment of a home equity line of credit is secured by your home just like your mortgage. So, if your mortgage is $200,000 and you borrow $70,000 via a HELOC, your total secured debt becomes $270,000. Before you can borrow a HELOC, your bank will run a stress to see if you qualify. Once you qualify, you can use as much or as little of the HELOC as you wish. There is a monthly cost once you draw funds from your LOC. You usually are required to make interest-only payments on your outstanding balance. Interest is calculated daily. HELOC interest rates are set as Prime plus a number. You should know that a home equity line of credit is a “callable” debt, which means there is no limit to how the bank can change the borrowing conditions of your line of credit. One of the biggest risks is a rise in interest rates. Your bank can change the rate charged on your HELOC at any time. Another common example is requiring you to begin making principal repayments. Your original terms may have required that you make interest-only payments on your HELOC. But, if your financial situation changes and the bank deems you to now be a credit risk, you may be asked to pay a portion of your outstanding loan balance, in addition to interest. This new repayment expectation can be a shock to your finances if you’re not ready. Most importantly, when you borrow against your home, you’re increasing your secured debt obligation. This can be an issue because failure to repay a secured debt means losing the asset that secures it. In this case, the asset is your home. What if you have to relocate for a job or due to divorce? Could you sell your home for enough money that you would recover your mortgage principal plus HELOC and selling fees? You don’t want to be stuck paying a negative balance. Could you still afford HELOC payments if you lost your job? What if your home value decreased? It’s not uncommon for Canadians to owe more on their homes than their properties are worth when the real estate market falls. This concept is called being ‘underwater’ on your mortgage. While being underwater and effectively having zero equity doesn’t have to be a problem, your ability to refinance any unsecured debt you accumulate would be limited. Could you afford an interest rate increase? As mentioned, your bank can change the cost of servicing your HELOC at any time. Could you afford to pay more towards your debt than you already do? Do you already have unsecured debt? If you already have credit card debt it may not wise to add to your debt by borrowing more through a HELOC. It’s in your best interest to pay down your other debts first before taking on new debt, even if the interest rate is low. A common method of paying off high interest unsecured debt like credit cards is by refinancing with a HELOC. There is nothing wrong with this strategy as long as it deals with all of your unsecured debt and you avoid accumulating unsecured debt again. Scott recommends that if you do opt to refinance, you should cut up your credit cards to avoid any temptation to build up the balances again. Your bank will try and make a HELOC sound great, after all the bank makes money when you borrow. A HELOC also has limited risk for the bank. If you are unable to repay your HELOC, they have security against your biggest asset – your home. But at the end of the day, no matter how affordable a loan is, it’s still debt. Tell your lender you want to go home and think about it. Say the full HELOC number out loud. Are you being offered $70,000? Saying that number out loud reveals just how big of a number it is, which can make declining more easy. Think about your entire financial picture. Do you really need a HELOC right now and can you repay it down the road? For more details on how a HELOC works and the risks to borrowing, tune in to today’s podcast or read the complete transcription below. Doug: When I have Ted Michalos on this podcast, if I want to get him all fired up I mention the type of debt that is his pet peeve, payday loans. Well today I’ve got Scott Terrio on the podcast so I’ll pull the same stunt with him and mention his debt pet peeve. Yeah, you guessed it, HELOCs. So let’s see how good a job I can do getting Scott all wound up. Scott is the manager of consumer insolvency here at Hoyes, Michalos and he is frequently quoted in the media, often about HELOCs. So Scott, welcome back to Debt Free in 30. Ready to talk HELOCs? Scott: Thank you, Doug, I am, yes. Doug: Well so let’s start with the obvious question then. What is a HELOC? Scott: Right. Great question. A HELOC is a home equity line of credit, and a lot of people have them. Scott: So a home equity line of credit, think about the term, it’s home equity, so you’re using – you’re borrowing against the equity in your home. So you’ve got room between your mortgage and the value of your house, so you’ve got equity. The bank’s happy to lend you based on that. So it’s secured to your house, or it’s secured by the physical asset that is your home. So if you don’t pay, just like with your mortgage that’s the asset that’s under scrutiny by the bank. There’s no amortization period with HELOCs so it’s just here you go and unlike your mortgage which is laid out for you for the next, you know, 25 years sort of in terms of how much it’s going to be paid down and the payments and all that stuff, there’s none of that with a HELOC. Scott: Where it’s paid off. Doug: So I know that in 25 years if I make all my payments it’s done. Doug: Whereas with a HELOCs, so what am I paying in a HELOC then? Scott: And I think the latest figure in Canada is 25 or 30 percent of HELOC borrowers are paying interest only. Doug: So I borrow $10,000, the interest is X number of dollars this month, I pay that, I still owe $10,000. Scott: The principle’s going nowhere. Doug: And I could be paying my interest for years and years and years and still owe the same amount. Scott: Right and I think the average borrowed amount of a HELOC in Canada is $68 or $70,000 and the average approved is about $168 or $170,000. Scott: So there’s an awful lot of runway as they say. Doug: So that all sounds fantastic then. Scott: It does. It sounds great. Doug: Yeah, it’s secured by my house, so the person who’s lending me the money, the bank, has very little risk because unless the real estate market totally collapses they can always get paid. So the interest rate is typically very low. Way lower than a credit card interest rate. And I’m getting – I’m paying a lower interest rate. So the bank has no risk, I’m paying a low interest rate, this is fantastic. I guess the show’s over, this is the greatest thing ever and I cannot envision any possible downside to this scenario. Scott: No possibly, and I think that’s probably exactly the sales speech that people get, pretty much, Doug, is this is great. And that’s – the way you said it is probably exactly why there are so many HELOCs out on the Canadian marketplace. Doug: Well can you think of any possible downside to this fairy tale that I just told? Scott: I can think of a few. Number one is they float with the interest rate. So as you know, interest rates have gone up five times in the last couple of years. They could be going up again. There are some reports saying no, but you have to, probably, if you’re a prudent borrower you would have to expect that they would, because on a balance of $70,000 that’s not insignificant for a rate hike. Or especially multiple rate hikes. So if you have three, four, five rate hikes on 70,000 or more, that’s going to be a significant hit to your pocket on your interest payments. Doug: Yeah, if interest rates go up by a quarter a point and I’ve got to pay an extra 20 bucks, well who cares? Doug: But if that happens, as you say it’s happened five times and we’re recording this at the end of January 2019, so if you’re watching this in the future, you know, internet world, then perhaps they’ve gone up more than that, but five times 20 bucks in my example, that’s a hundred bucks. Again, it doesn’t seem like a big number, but that’s a hundred bucks every month, now you’re paying 1200 bucks extra a year, all your other debts have also gone up and become significant. Scott: And the other factor in that, as we know from our business, is that home owners tend to have a lot more unsecured debt than renters. About 20, 30,000 more. So if you have a home equity line of credit that’s gone up a hundred bucks in those five rises, you probably also have two or three other lines of credit that are unsecured, those are also going up. Doug: Yeah, and that’s a very key point. Scott: – that, you know, and I’m not sure exactly their statistical validity, but a lot of Canadians are close to the edge every month. So 200 bucks, to me that’s significant as a monthly expense that you didn’t expect to have. Doug: And your point is a very valid one because we notice this when we do our Hoyes, Michalos Joe Debtor bankruptcy study that you’re right. Somebody who owns a house and has a mortgage also has more unsecured debt. They’ve got more credit card debt, and that’s partly because they’re a better risk to the bank. You own a house so you’re not going anywhere. Doug: So you end up having more of that higher interest rate debt too. Okay, so downsides to HELOCs. Number one, they can increase the interest rates any time because your typical HELOC is a floating rate, so anytime the Bank of Canada raises rates there’s a very good chance that your rate is going up. What are the other problems then? What are the other risks I should worry about? Scott: – they know whether their mortgage is fixed or variable. Okay, that’s great. That’s about all I can handle in my head. But what if there were no other rules on your mortgage? Okay, so here’s 700,000 Mr. Hoyes. Pay it over 25 years, but we might just change this along the way at any point and you can’t do anything about that. Doug: And so what kind of rules could get changed then? I mean the interest rate is the most obvious one, but you’re right, they could decide that we don’t want you to have this HELOC anymore. And we’ve seen that a lot with unsecured lines of credit. Doug: Which are not HELOCs. They’re not secured by your house. I mean you and I can both tell lots of stories about that client who was paying 5 percent a year ago and now it’s 10 percent. Doug: It’s not because the interest rates have gone up, it’s because the bank has said, oh, you look like a higher risk than you used to be. We’d like to squeeze you a bit. Maybe you’ll jump off and go somewhere else. Scott: I think that’s the hidden monster in this, is the credit cycle is turning so we had a good run for – you know, we had emergency interest rates for almost a decade, because they just left them low. So everybody got used to having almost virtually zero percent interest on everything. And we went on a debt binge as consumers. So now – you and I see this more as frontline people, so I think it maybe is more apparent to the work that we do. For at least a year or so now the banks have been behaving differently in terms of how they vote on proposals, which is a really good canary in a coal mine for us to see, okay, well the big five banks and the next secondary level of lenders have all done whatever they want over the years in terms of voting on proposals. So some of them are hard asses, so of them are easy to deal with in proposals. And we’ve seen in the last 12 to 18 months, especially the last six, that’s starting to change. So the banks are getting – they’re getting more nervous. This is normal in this type of a cycle. Doug: So change in what way? Scott: Like voting down proposals. Counter offering really hard counter offers. You know, someone who’s offering their creditors a percentage settlement that we got accustomed to seeing as being accepted, now the banks are going, you know, we’d like a little more than that. So then of course we go, okay, and if that happens for a number of months it’s a trend. So that is happening. And so when you think about HELOCs and the fact that the banks can kind of pull whatever levers they want, I don’t think they’re going to, as I said, go call them all. That would be suicide. But I think what they’ll do is they’ll make little tweaks along the way that hurt you a little bit. It’s like your term, death by a thousand cuts. And so if you’re exposed in that manner as a consumer, well do you want to be at the whim of a bank that’s nervous? Doug: Well, so your HELOC might be set up that you’re paying interest only. There’s no reason the bank can’t say, oh, you know what? We’ve changed the terms. Now you have to pay 1 percent of the balance each month plus interest. Like, they can do that any time they want. Scott: They can do anything they want. So you could almost come up with almost anything that a bank could tweak if they’re getting nervous. So they’re probably going to go after a certain type of lender first, because they’ve got their categories, their borrower. This type of borrower, that’s really bad. The other ones we’re going to leave them alone for a while. Doug: Well and most banks, and again maybe people don’t realize this, do a soft hit on all their customers. So every quarter, let’s say, and I know one bank in particular definitely does this because the VP told me. They will do a credit check. It’s a soft hit so it doesn’t show up. You don’t actually know it’s been done. It doesn’t affect your credit score or anything. But if they see that, oh, look at the trend. You’ve got a bunch of other debt. Your credit card balances are going up. We’re getting a little more nervous as you just said. So this is the perfect opportunity for us to say, you know what? Even though the Bank of Canada raised interest rates a quarter of a point, we’re going raise your HELOC interest rate half a point. Or a full point. They can do whatever they want. Okay, so we’ve talked about the risks to me the borrower. But hey, look, why should we worry? It’s guaranteed by my house. That’s the whole point of a HELOC. Everything’s good. Don’t worry about it. Right? Scott: And what if house prices drop? Doug: It could never happen. Doug: For those of you who aren’t watching on YouTube he did the sign where you’re right up to here, right up to my chin here. That was the chin sign. Doug: Have to watch this on YouTube. Scott: Those people, even if the market’s down 10 percent, and a lot of places it’s down more than that, you’re under water. Now that doesn’t mean anything. Okay. It just – anything more than the fact that your house is worth less than you owe. You don’t have to leave. The bank isn’t going to come after you. You keep making your mortgage payments, everybody’s happy. But it makes a number of people again nervous. Doug: Well you can’t sell your house and get out even. Doug: And this whole word under water is a word we haven’t said for the last 10 years because house prices since around, I don’t know, 2009, 2010 have been increasing and we’re talking primarily about Ontario but I think anywhere in North America it’s pretty much the same thing. Doug: There may be some pockets, like Fort McMurray got hammered a few years ago. But in general house prices have been going up. So it didn’t really matter how much I borrowed. It didn’t matter if I borrowed 95 percent of the value of the house, next week the house would be worth more so I’d be building, building equity. But since the market peaked around May of 2017, I guess, and has been falling ever since – and you’re right. In downtown Toronto, which is where we’re recording this right now at our office at Yonge and King, the condo market is still strong. I mean it’s still growing and the prices are still going up. But you go to places like Oshawa, Richmond Hill, you know, west of Toronto, single family detached homes, there are some areas where we’re getting reports of prices dropping 20 percent. And so if you paid a million bucks and financed it right to the hilt, $950,000 in mortgages and your house is now worth 800, and you sell it and have to pay real estate commissions, you are, as you say, under water by potentially a couple of hundred thousand dollars. Now if I have a mortgage that is, you know, 80 percent loan to value. Okay, if the price goes down 20 percent, I guess that puts me back to even. But HELOCs, as you explained it, are on top of a mortgage. And that’s where the huge risk potentially comes in then. Scott: Right. I mean if you had a mortgage of 700 and your house was worth a million and you borrowed 100 with a HELOC, now you’ve got 800, so again, if it went down 20, now you’re flat again so if you went to sell your house you’d be underwater. Because being flat and selling your house with the costs of selling a house, now you’re underwater by that margin again, right? Doug: So do you think we have a false sense of security because, well house prices, okay, maybe they go down a little bit, but it’ll all be good and if I don’t sell my house it doesn’t really matter and I shouldn’t worry about it? Scott: I do. Because let’s put it in terms of unsecured debt. So if your bank, if you had $30,000 in unsecured debt, credit cards, line of credit, and your bank came to you and said, you know what? We’re having a banner year. How would you like another 70,000? But we won’t give it to you at a credit card rate of 18 percent. We’ll give it to you at five or something. Would you take it? Sure, that’s a great deal. You probably wouldn’t touch it because it’s unsecured. Where the HELOC risk comes in, I think, and this is kind of insipid – it’s your house so therefore it’s great. It’s safe, you’re going to live in it forever so if I borrow against it so what? I mean I’ve got my whole life to pay this off. And again, translating that balance, that average 70,000 into another type of debt, you probably wouldn’t – there’s no way. First of all, the bank wouldn’t offer that. But in HELOC they’re happy to because it’s your house. Doug: So your point is if I have 50,000 or 70,000 in credit card debt, I’m freaking out. Doug: Or additional. But if I have a $70,000 HELOC, I’m not worried because the interest rate’s lower, but even so it’s guaranteed by my house so everything’s going to be fine. Scott: And how did that stack of books find its way there? Doug: I don’t know how they managed to get in the camera shot here. That’s amazing. Somebody must have set it up – yeah, myth number 13. A house is a great investment. Myth number 14, owning a house gives you stability. Myth number 15, the bigger the mortgage the better. So you’re right. Real estate is a big thing for us as Canadians, and I assume that’s why the banks love it. So according to my notes here, banks have lent out billions of dollars in HELOCs, something like $230 billion dollars. That’s a really big number. Why is – but the interest rates are low. So why do the banks like them so much? I mean you think they would like credit cards more because the interest rates are higher. Scott: Yeah, because of all the things that come with it, I think. So first of all, it’s secured, so for the banks, nice low risk. We can always take the house if we need to. We don’t want to be house owners but you know, if worst case scenario we take the house and we’re pretty much made whole. But the other thing is, is that it gets you more locked into this debt trap or cycle. They’ve got you that much more. And as we’ve said, the average home owner that we see in insolvency has $30,000 more in unsecured debts. So all those trappings come with this. And the other thing is, when banks lend, they want to lend profitably. Right? Scott: Back to the whole credit score system. They want you as a client because they’re going to make money off you. They don’t want to do a risk assessment on you so that you’re safe. They do a risk assessment on you so that you can make them tons of money over time. Doug: So that they’re safe. Scott: And so the other things with the ATMs is the ease of usage and this is probably my biggest pet peeve about them. It is so easy to tap them and it is so easy to use them because they just say, here you go, and they approved you for the 68,000 or whatever. You don’t have to keep going back to that. So the barrier, the psychic barrier of getting up, going to the bank, sitting there in a suit and begging for more money isn’t there. Right? You just – here you go, it’s basically a cash ATM. And the banks really want that because you’re going to use that right? Doug: Yeah, you’re right. To get a mortgage there’s a bunch of stuff I’ve got to do. I’ve got to apply, I’ve got to show my income, in most cases. Scott: You’ve got to grovel a little bit. Doug: Yeah, and you know, do you qualify? What’s the appraiser going to come in at, boy I’d better talk to the appraiser and make sure that he saw that I painted that wall over there and it’s worth more. Scott: And I’m cash flow tight, like many Canadians. Doug: Everybody is. So it’s like, you know what? The car transmission broke down. Why don’t I just use it for that? Or why don’t we put in a deck, or a pool or something. And – my recollection is that’s really how we got started in all this, wasn’t it? Scott: It was. The original intention of this, and this may be going way back before they were called HELOCs, but the idea was you use the equity in your home during good times to improve the home significantly enough – not painting the wall, but put like a pro kitchen in, or put, like you said, a deck, or something that is really going to have attractive curb appeal or interior appeal later on when you go to sell it. Because usually you can inflate the price much more than the renovation was if it’s all done nicely. Scott: They almost don’t exist. So you know what? Like anything else, banks see something good, they just start handing it out more and consumers who entered the era of low wage growth and things getting more expensive, especially in cities found themselves strapped. And you want to live the lifestyle right? So you know, you said, that hundred grand is sitting there. How temping is that? Right? Doug: Well and if I have some money owing on my credit cards that are a high interest rate, it’s prudent financial management to say why don’t I take 20,000 off my HELOC, pay off my credit card. I’m exchanging a 20 percent interest rate for a five percent interest rate, that’s actually good sound financial management, isn’t it? Scott: It’s great. Except you still owe the debt over time. And I think instead of paying that debt down, you’ve just shifted it. So yes, it’s lower interest, that’s – that is a good move, technically and mathematically. But I think it shows that people are looking at their unsecured debt and going okay, instead of paying that down I’m going to pay it with this, but that’s not paying it down. Doug: Particularly if it’s an interest only HELOC where you’re definitely not paying it down. Doug: And as you already alluded to, that’s great but we know that homeowners tend to owe – well, they do, it’s a fact – they owe more on their unsecured debt because of that exact same thing. I’ll use my HELOC to pay off my credit cards, but then I use my credit cards again so now I’ve got actually more debt than I started with. Scott: Yeah, and part of this is the whole normalization of debt. You know, debt is the new normal thing. It’s the whole thing of the debt zombie. We’re just a walking group of debt slaves and we don’t care if it’s on our credit card or if we shifted it over here. It doesn’t bother us much. Doug: So why is it then that, you know, five times a week you and I talk to someone who says yeah, I did get preapproved for this, I didn’t ask for it, the bank just said, yeah, here you go, you’re a good guy, here it is. Is it as simple as, well this is how they make money? That’s why they do it? Scott: Yeah. I think it might be. Like when you are – when you’re faced with the bank offering you a HELOC of 70,000, probably what you should do is instead of just taking actually say, okay, I’m going to think about that. I mean I’ve counselled this before on HELOCs and in pieces I’ve written and on TV just saying, just stop, right? So take the pressure out of the situation. Take the sales pressure out, go home, think about it. I mean the bank’s going to make sure they call you again. They’re going to want to sell you stuff. It’s what they do now. So stress test yourself, right? So if I’m going to get 70 grand and I’m going to – eventually I have to pay that off in some way, shape or form. So maybe make yourself a worst case scenario. If rates go up another five times, not likely to happen, maybe, but it could, right? Doug: It very well could. Scott: They’ve been really low for a very long time, and anybody older than 35 has seen this kind of thing happen before. So stress test yourself and make sure the worst case scenario comes up, you can make at least monthly payments if not contributions to your debt. Doug: And when you talk about stress testing you’re talking about things like, well if I lost my job what would I be able to do? Doug: I think there’s another element to that, and that is, what if you had to move? So let’s say you get a fantastic job offer in Alberta. Scott: Can’t turn it down. Got to go. Scott: In the outer rim. Doug: In the outer rim. And so I can’t sell it and get enough to pay off the mortgage and the HELOC. So what do I do? Do I sell it – what you’d have to do is go to the bank and say, okay, I’m going to sell my house and there’s going to be a $200,000 shortfall. I need you to give me a $200,000 loan so I can move. Is the bank going to want to do that? That sounds pretty sketchy to me. Scott: But these things happen. Doug: They happen all the time. Scott: That’s a real-life example right? Doug: How many people do you know of your circle of friends who’ve been living in the same house for 20 years? Scott: None. No, one. I’m sorry. And I’ve got a big circle of friends, and I can tell you one. And in my parents’ generation it would have been everybody. Doug: Yeah. I mean the house I grew up in, my parents were there for, I don’t know, 20 years, 30 years, whatever it was. It was a long period of time. But now we’re much more mobile. Scott: Absolutely. It’s a different world. Doug: And we all want to buy the McMansion. So we start out with our little condo and then we get married and we buy the starter home and then we move up to the middle home and then we move – so whereas our parents kind of lived in the starter home their whole life. There was no need to do it. So I think that’s the other element of the stress test is what are the chances I will have to move? Maybe I want to move. Maybe I just want to move on the other street so my kids are in a better school district. Owning a house, as I said in the book, does not necessarily give you stability. It can actually give you an anchor. So if you’re offered a line of credit, should you take it or not? Scott: Well I think you have to make that part of your – you have to think of it like your mortgage. Let me give an example that’s a bit out of the blue but I thought it up this morning on the train. So average HELOC 70,000. So people don’t think much of that. They just kind of go, okay, sure that’s great. It’s over time, it’s not going to bother me. But put yourself back in the scenario of when you bought your house if you bought in the last few years. It was more likely a bidding war if it was in the city. So what if you were all five or 10 of you in there were working with your agent trying to get that – removing this condition and that, and then it goes up another five and we’ve all got to go up 5,000 in our offers. If somebody came in and did a bully offer of 70,000 more than you were offering. Doug: A bully offer is just way higher than what everyone else is offering. Scott: Yeah, you were all in there battling at 800,000 and some jerk came in and said I’ll give you 870, and everybody said that’s crazy I’m out. Well that 70,000 is exactly the same that you were offered by the bank in a HELOC. It’s just after the fact instead of at the front. So you would have freaked out at the bully offer, but no problem. The bank offers you 70,000 once you own the house, hey no problem. I’ll take it. Doug: And 70,000 is 70,000. Scott: It’s 70,000. It’s normalization right? People say 70. Right? Doug: Yeah, you don’t say 70,000. Scott: You say the whole amount every time. Doug: Oh, that’s good. Say the whole amount. Scott: Like 1.2. It’s one million, two hundred thousand. It sounds different right? Doug: Yeah and so whether I pay 800 or 870 for a house, oh I’m not going that high. But to tack an extra 70 on at the end on a HELOC. No problem. And it’s the same 70. Scott: It’s the same 70,000. In fact it’s 70,000 that’s subject to interest rate rises. Whereas if the 70 was when you bought, you probably locked it in at whatever. Right? Doug: So you got much less risk. So I like that. There’s your practical advice tip for the day, say the whole number. Don’t say 70, say 70,000. Scott: Call it what it is. Doug: Call it what it is. Scott: Treat it with the respect it deserves. It’s money. Doug: So let me play devil’s advocate here. I can see why high interest credit card debt is a problem. But why – because it’s high interest. I get it. Why then are low interest HELOCs a problem. And I understand, okay, interest rates and everything. But 70,000 on a HELOC is a lot less of a worry than 70,000 on credit cards. Scott: Right. But I think you take the whole picture of the economy into account, right? So that’s 70,000 right? Plus your 800,000 and give it the respect it deserves. Scott: By theory is there’s a significant chunk of Canadian society that is living very close to the edge. In other words could you absorb an impact of any kind? An impact being divorce. That’s a huge one. Job loss. Doug: Well you have the flu and you’re off work for a week. That’s a big shock for a lot of people. Scott: And if you – other studies show that nobody’s got any savings, so there isn’t a cushion there of cash – well that’s why you got your HELOC, I guess. Scott: Savings are HELOCs now right? So I think when you look at – HELOCs are not a problem in and of themselves. But you’ve got to look at the whole thing you’ve got going on. Because when I have people call me as recently as yesterday who are homeowners with HELOCs and second mortgages and all kinds of stuff, they have a number of things going on in their lives, right? And so they’ve gotten to the place where they’re at where it’s taken time for all these little factors to come into play. But it’s death by a thousand cuts again. So yes, the HELOC’s a good idea but make sure you can afford the thing if it changes. Make sure that you can afford all the other things in your life. So in other words, if you’ve got 30,000 in credit card debt, don’t take the HELOC. Not yet. Pay that down and then do it. You don’t need to do that right now. So it’s wants and needs, right? Doug: Well so let’s finish this off then with your advice. So you just gave a piece of advice. I still think the best advice is say the full numbers. So we probably should have just ended the show right there. Scott: One point two million. Doug: One point two million dollars. Scott: Say it like what’s his name in Austin Powers. Million. Doug: It’s a big number. So – but I think the next point you just made is, if you’re going to be getting a HELOC to pay off your credit cards, okay, I understand why that makes sense, cancel the credit cards then. Doug: Or lower the limits on them or something. Doug: Because paying them off and then racking them up again wasn’t really paying them off. Scott: That’s the other big takeaway from this one folks, what Doug just said. We usually see – when people consolidate their debts the reason they come back in to see us again a year from now is because they didn’t cancel their cards. Right? So if you are going to tackle the debt before you take the HELOC, which is what you should do, cut the cards up. Because I can’t tell you the rate of recidivism on that stuff. If it’s there you’re going to use it again right? Doug: If there was a $20 bill sitting on the table, one of us would pick it up because that’s just how it is. Scott: I don’t think you’d beat me to it but one of us would get it. Doug: We’d probably rip it in two as we went for it. That’s just the way it is. So are there any other pieces of advice, then, that we haven’t hit on here that people need to be aware of? Scott: Well, okay, so if you are in the kind of scenario where you’ve got all kinds of balls in the air, like the people that are calling us something, you’ve got a mortgage, maybe a second mortgage, maybe a HELOC. You and your husband or you and your wife are both working jobs where you’re not entirely – you’re not going to be there 30 years risk free. Your job could change. You could move. You’ve got a couple of kids, so those kids, they’re factors. They’re big factors right? Because okay they’re healthy right now, maybe they won’t be. But without freaking people out, look at your entire picture and say okay, what are my big risks here? In any one of these things. Can I keep going here for even three months if anything happened? And it never hurts to talk to somebody. Because I mean how many people that come to see us end up filing? Doug: Well certainly less than half. Scott: Right. So we talk to a whole bunch of people, thousands of people who we just give them advice on what they should do about debt and stuff like that. For free. Doug: There are some people who come – yeah, and we’ll say, you know what? You’ve got a lot of equity in your house, so if you’re willing to cut up the cards then a HELOC maybe makes sense for you. Pay them off, and you don’t need to be doing a proposal or going bankrupt or anything like that. Scott: And it costs nothing to talk, right? So if you have a lot of debt you’re not necessarily in trouble. But it doesn’t hurt just if you’re stressed out about it and if you’re thinking about it like that, just talk to somebody, right? Because at least you’ll know your rights. You’ll know what you can do, what you should do, what you shouldn’t do because often times it’s make sure you don’t do this or this because you’ll get in even worse trouble. Doug: Yeah, stress is an excellent indicator of whether you’ve got a problem. So if I own a million dollar house and have a $500,000 mortgage, 500,000’s a huge number but I’m not really in that bad a problem there because I can sell the house and get out of it. If I don’t own a house and I have $500,000 in debt, I’m probably toast unless my income’s a million dollars a year. So I would be under a lot of stress in that situation. That’s a good indication that you need to reach out for help. Doug: Excellent. Well I think that’s a great way to end it and that tip again folks, say the whole number just in case you missed it. Scott: And cut up your cards. Doug: And cut up your cards. Scott, thanks for being here today. Doug: That’s our show for today. As always you can find a full transcript of today’s show and links to everything we talked about we talked about in the show notes over at Hoyes.com. I’ll also put a link to Scott’s Twitter account so you can follow what he’s up to. He likes to go off on little Twitter threads about the people he’s met with and what’s happening. So that’s always entertaining. And a reminder. You can subscribe to the video version of Debt Free in 30 on YouTube so that when Scott give the up to their chin symbol you can see it. Doug: Absolutely. And the audio version is also available on all major podcasting apps including iTunes and if you like the show I’m always thankful if you leave a review. Thanks for listening, until next week, I’m Doug Hoyes. That was Debt Free in 30.